1968 Life Magazine Bearing Beatles Returned To Library With Apology And $100 A spokesman for Ohio's Cuyahoga County Public Library said there are no hard feelings about the extreme delay and the return sets a good example. "We just want our stuff back," Robert Rua said. 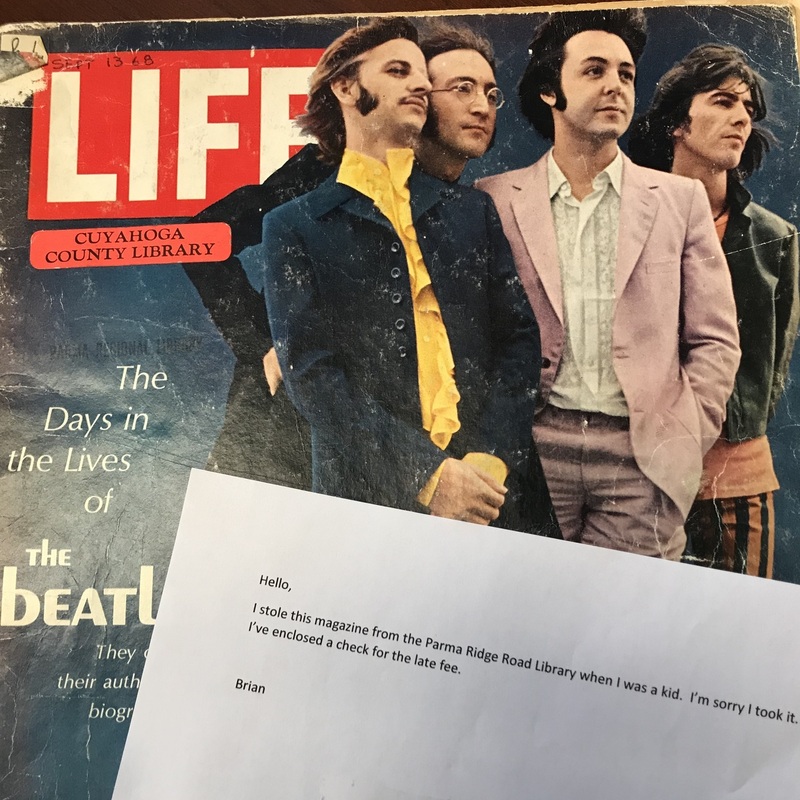 The staff at Ohio's Cuyahoga County Public Library were surprised to receive a 1968 issue of Life magazine featuring the Beatles from someone who said he stole it as a kid. Fifty years have passed and the issue is showing some wear and tear, but John, Paul, George and Ringo still loom large against the stark blue backdrop on the cover of the Sept. 13, 1968, Life magazine that is once again in the possession of its rightful owner in Ohio. Somebody returned it last week to Cuyahoga County Public Library via USPS priority mail, complete with a note of apology and a $100 money order to cover any fines. The note reads: "I stole this magazine from the Parma Ridge Road Library when I was a kid. I'm sorry I took it. I've enclosed a check for the late fee." Signed, Brian. "It's a story about doing the right thing," Cuyahoga County Public Library spokesman Robert Rua told NPR. He said this is the oldest item he has ever seen returned, exceeding the reach of the library's records. Despite the decades that have passed since "Hey Jude," "Hello, Goodbye" and "Lady Madonna" ruled the charts, Rua said the library system does not allow fines to keep accruing and Brian would have owed less than $100. "There really isn't a Mr. Bookman, no library cop," like on Seinfeld, Rua said with a laugh. The magazine is a bit yellowed and showing signs of age but remains in fair condition, Rua said. "It is still intact and no pages are missing." It also still bears the orange Cuyahoga County Public Library ownership sticker, making its provenance clear. But Rua notes that the Parma Ridge Library building of 1968 is no longer in existence, having moved to a new location. Rua speculates Brian was a teenage fan of the Fab Four at the time, unable to resist the urge to walk off with what would become a collector's item. "Inside the magazine is the first of a two-part excerpt of the first official biography of the Beatles written by Hunter Davies," Rua said in an emailed statement. "It covers the Beatles early days in Liverpool and the time they spent cutting their teeth playing clubs in Hamburg, Germany's Reeperbahn district." It is not known whether Brian lost affection for people and things that went before, or whether he felt guilty and was looking to make it better. The Nowhere Man remains a mystery. The magazine was mailed through Wright-Patterson Air Force Base near Dayton, Ohio, Rua said. And while a signature is scrawled on the money order, the last name is illegible. But Rua hopes Brian steps forward. "We would thank him for setting a good example — if belated," Rua said. "We just want our stuff back." The library system, which has some two dozen branches in the Cleveland area, still believes in yesterday. Rua said the plan is to get a case or a frame and put the magazine on display.